"As bald brother Reuben, Thom Allison stuffs the nostalgic French-café chanson Those Canaan Days with enough Chevalier-style ham for a dozen croissants, showing off the nimble voice, comedic flair and huge stage presence that have him headed for Broadway before this run ends." A once-chubby kid from Transcona is bound for Broadway, where he’ll be decked out like a smokin’ hot showgirl. Winnipeg-born musical theatre star Thom Allison has to bow out of the final week of Joseph and the Amazing Technicolor Dreamcoat, running at Rainbow Stage Aug. 3-27, for a much more glamorous assignment. 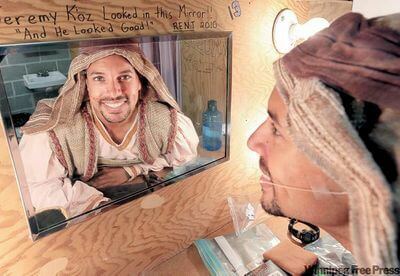 The 38-year-old tenor/baritone, who was a soulful standout as a gay anarchist in Rainbow’s Rent this summer, will give his final performance as Joseph’s brother Reuben on Aug. 20 (Jeffrey Kohut will finish out the run). After a one-day stop at home in Toronto, Allison flies to New York to start five weeks’ rehearsal for the North American première production of Priscilla Queen of the Desert — The Musical. What did it feel like to hear from his agent that he’d been chosen for his first role on the Great White Way? The son of a black father from Nova Scotia and a white Mennonite mother from Steinbach has made a lot more noise in his career than most Rainbow Stage performers. He agreed to come home for both Rent and Joseph, he says, partly because it was a “low-pressure situation” that allowed him to spend 12 weeks reconnecting with his parents, friends and older brother, bass guitarist Brad, before his Broadway adventure. It was also a chance to give something back to Rainbow, where he last performed as an overweight teenager 19 years ago. “The chances of my getting back here are looking slimmer,” says the much-travelled veteran of mega-musicals such as Miss Saigon and The Who’s Tommy, as well as the Shaw and Stratford festivals. Recently, Allison earned raves at Manitoba Theatre Centre and in three other cities as Aldolpho, the scene-stealing lothario in the musical The Drowsy Chaperone. The campy Priscilla, based on the 1994 Australian movie about two drag queens and a transsexual on a road trip across the outback, opens in October for a 12-week pre-Broadway run in Toronto. It’s scheduled to open next March in a yet-to-be-announced Broadway theatre. Allison is a member of the ensemble and the understudy for Bernadette, the central transsexual role. He’s also the understudy for Miss Understanding, a drag-show host. He had to appear in drag for a callback audition. He assembled his outfit using high heels from having understudied the drag queen in Rent, a gown from doing a solo drag cabaret act, and a wig borrowed from a Tina Turner impersonator. He is, in fact, a cross-dressing veteran whose breakthrough starring role was the Craig Russell female-impersonator part in the Toronto musical Outrageous 10 years ago. Priscilla reportedly features 500 over-the-top costumes. The ensemble members play showgirls in a flashback scene, so Allison will be in diva mode for part of every performance. Musicals were not on his intended path when he started theatre school at Ryerson University. He planned to become a classical actor, but realized with the encouragement of a voice-freeing teacher that he could sing in any style. He left university about 20 years ago, just as “colour-blind casting” took hold and directors were looking for strong visible-minority actors. He could “sell” dance moves much like he sang — through instinct and imitation. But his stage sparkle was a façade that hid insecurity and self-loathing. He was so “terrified and panicky” at theatre school that he dropped 50 pounds. Throughout his 20s, he says, he felt like a fraud, particularly as a singer. He was a bulimic with a distorted body image. “I hated my body. I thought I was ugly,” he remembers. He had some therapy, but mostly recovered through his own reading and research. Today, as thrilled as he is to be Broadway-bound, he says his ultimate dream is to do more solo cabaret and concert work where he selects the songs and is simply himself. “I get to choose the journey that we go on for the evening,” he says about that kind of show. Looking back to small roles he played at Rainbow Stage, he says being fat was a blessing in disguise. As a 240-pound teen who never thought he could play the romantic lead, he honed his character chops. Unwittingly, he says, he was preparing for juicy roles like Aldolpho or the flamboyant MC in Cabaret.